Why would you want to create your own FubuMVC behaviour? My breif was to make sure that all request handlers than use an ISession are wrapped in a transaction. Now if I navigate to _fubu I can see that the handlers which have an ISession injected are now wrapped in a transaction. Any handlers which don’t make use of ISession are not wrapped in a transaction. The code for this example can be found on my git hub account here. As you can see with very little code you can add code to all the handlers which use an ISession. Good luck and let me know if I’ve done anything wrong or if you can think of any improvements. Would be great to hear your feedback. 1)So long as you register your dependencies transiently, the Nested Container in Fubu will do the "http request scoped" business for you. 2) I see that you're using Advanced Diagnostics. Did you know that it also records requests? 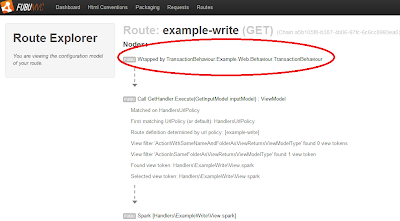 The visualizers for a request aide in understanding how the behaviors all fit together. Thanks Josh... especially for the feedback. Great to be on board. I'm really enjoying FubuMVC.. think I've only scratched the surface so far. This may or may not apply in your situation. 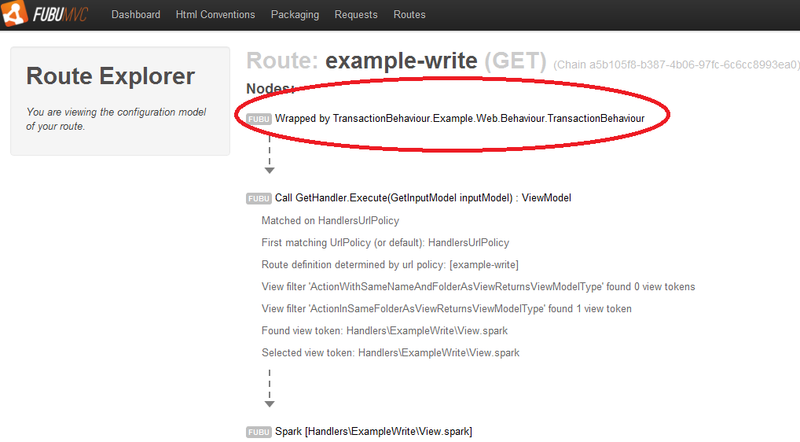 For most of our applications our transaction behavior for the InvokePartial call will just call invoke partial for the next behavior. You'll get surprising results in some cases if you don't continue with the partial path. Also in many cases on the partial path you can assume that there is already a transaction present and not need to start a second. That just means that I can use the clean, easier to remember name “AppFunc” to refer to the type Func” as an alias in only that one file. I don’t use that very often, but it’s also a nice way to get around using two classes of the same name but different namespaces in the same file. I`m working on purevpn project, will let you know the results soon. Very informative blog.Thanks for sharing such good information and keep on updating. Very informative blog.Thanks for sharing such good information and keep on updating..
very good information...thanks for sharing...nice blog.. Very very nice information and useful as well. thanks for sharing such a great information with us! Hi, Thanks for sharing nice information it really good for reading this. Anyhave interesting to learn Digital Marketing Course in Ameerpet . Best institutes is Hyderabad Digital Marketing Institutes they provide all concepts SEO,SMM,SMO ADwords, Affiliate Marketing. Hi, Thanks for sharing nice informative post. One of the best blogs, where I collected valuable things to know. Its very nice to read your blog and im really appreciate to read that.Thanks to you for giving wonderfull ideas..